Ten Ten Tei review 2 – still as good as ever? The humble Ten Ten Tei is the standard by which I measure other Japanese restaurants in London, both inexpensive and luxurious. Although I’ve managed to sample a good smattering of dishes from its expansive menu on previous visits, I had yet to try their katsu curry which is an oversight given the poor quality katsu curries I’ve had elsewhere. Any worries I may have had about the kitchen at Ten Ten Tei overreaching were put to rest. Simply put, their version of katsu curry is the best I’ve had yet. The pork katsu curry has thin strips of very crispy yet succulent breaded pork coated in a sauce that’s highly reminiscent of chip shop-style curry sauce (the Japanese paradoxically learned about curry from the British), but which has a mouthwatering blend of gentle sweetness and pepperiness all its own. It’s not a complete meatfest with plenty of gently stewed carrots dotted throughout the curry and a small side helping of tart pickled peppers. Heart warming stuff on a cold autumn day. It may not look like much, but katsu curry is comfort food par excellence. 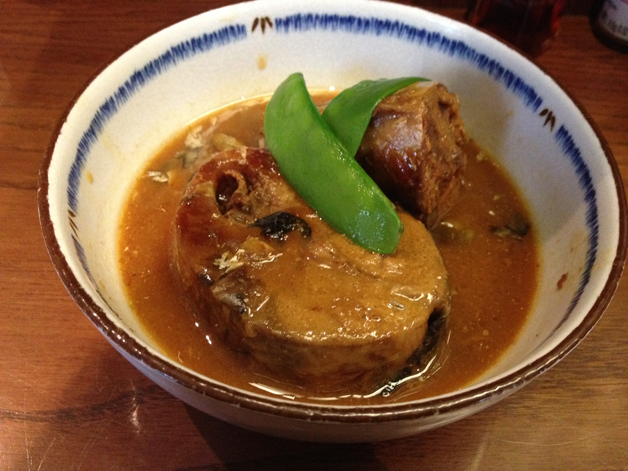 Before chowing down on the katsu curry, I also gnoshed on the saba miso – mackerel stewed in soya bean paste. The hefty chunks of mackerel are slathered in a rich, tangy, salty, distinctly bean-flavoured sauce that’s very moreish. It won’t convince anyone who’s dead set against fish or soya beans, but this boldly flavoured yet simple dish is perfect if you need to warm up after trudging through London’s cold streets. Fishy, but in a good way. The service at Ten Ten Tei is just as patchy as it’s always been – the proprietor is friendly, but his waiting staff are a surly lot. If you’re adverse to the cold, then it’s best not to sit at the bar near the door on a chilly day – the front door doesn’t close by itself properly so you’ll be buffeted by occasional bursts of cold air as people come and go. Despite a dodgy door and the same old service issues, I can’t help loving Ten Ten Tei. If the weather’s too cold for their excellent sushi and sashimi, then their katsu curries will be perfect. Highly recommended. Opening Hours: Monday to Saturday. Lunch noon-15.00, dinner 18.00-22.00 (last orders 30 minutes before closing). Total cost for one person including soft drinks (free green tea is served at lunchtimes): £15 approx. It’ll likely cost more if you’re ordering sushi/sashimi. 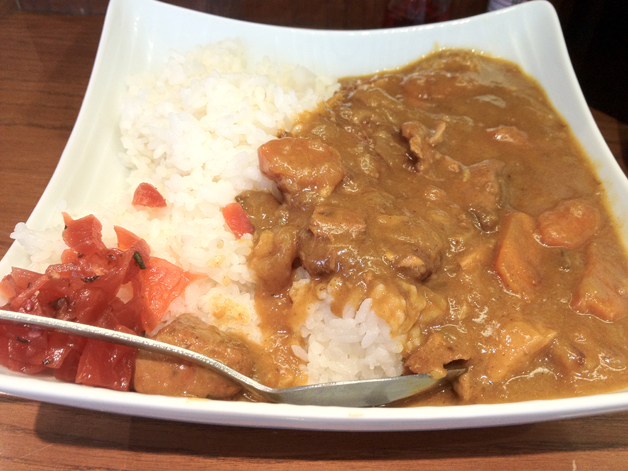 Tags: curry, katsu, london, mackerel, restaurant, review, ten ten tei. Bookmark the permalink. 5.5 Years have passed since your “still as good” review, do you still consider Ten Ten Tei the best Japanese comfort-eatery in town? It might be time for a revisit.